Some may have been pulling for Lee Westwood to win his first major in his home realm. Some may have been hoping that Tiger would add another notch to his belt in his pursuit of Jack Nicklaus’s majors-win record. Undoubtedly, there were many (like my niece) who wanted to see Adam (“Adonis”) Scott capture his second major of the year. And a few may even have been rooting for Henrik Stenson or Hunter Mahan to break through. But when all was said and done, you’d have to be a serious Phil-a-phobe not to have gotten warm feelings from Phil Mickelson’s win at Muirfield yesterday. 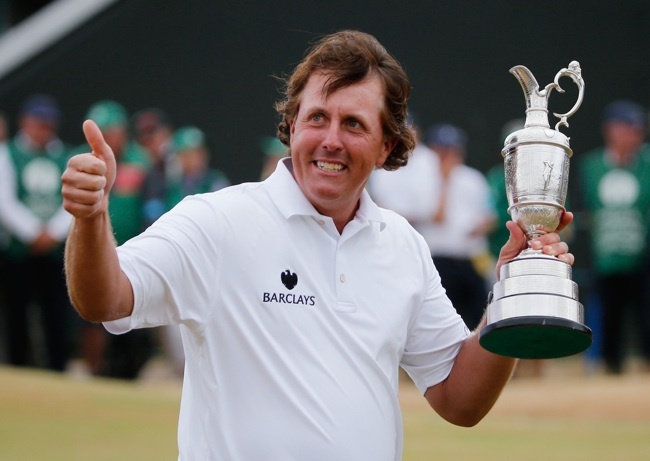 In June, Mickelson narrowly missed winning the U.S. Open at Merion. It was his sixth second-place finish in that event. Last week, he righted his ship by capturing the Scottish Open at Castle Stuart – his first win on a links course. Yesterday, with the sun shining over East Lothian, he started tied for ninth and used a back-nine charge of historic proportions to win his fifth major and capture the venerable Claret Jug for the first time. Nobody – NOBODY – would ever have predicted that ANY player could shoot 32 on that tough stretch of holes to steal the 2013 Open. But Mickelson did, without even seemingly breaking a sweat. Mickelson called it the best round he’d ever played. The shots he hit coming in will long be remembered by those who saw them, not the least of which being his approach to the 18th, which narrowly missed a bunker and set up his coup-de-grace closing birdie. But what the world saw after the round was over was even more compelling, I think. First, there were the tears in the eyes of Mickelson’s caddie Jim Mackay. Partners in golf for more than 20 years, they’d done something very special on this day and Mackay knew it better than anyone. Unlike many tour players, who go through caddies the way hackers go through golf balls, theirs is a partnership and friendship that has stood the test of time to the benefit of both men. Then, rushing over to greet Phil after his commanding finish were his wife, Amy, and his children, Amanda, Sophia and Evan, who gathered together in one big family hug to celebrate his awesome accomplishment. Hundreds of high-fives followed from fans as Phil went to sign his card, and as Phil held the Claret Jug high to the applause of the multitudes around the 18th green, it was clear that this was not just a popular win, but a win that was good PR for the game of golf. Mickelson is golf’s ultimate family man. He flew home to San Diego the day before this year’s U.S. Open to attend his daughter’s graduation. Her junior high school graduation. The family was there to see him win at Castle Stuart. And they were there at Muirfield to mob him after his Open triumph. In an age when too many athletes in too many sports care only about contracts, Mickelson’s values have traveled with him almost every week in the form of his wife and kids. What yesterday’s win showed was that sometimes, nice guys don’t finish last.